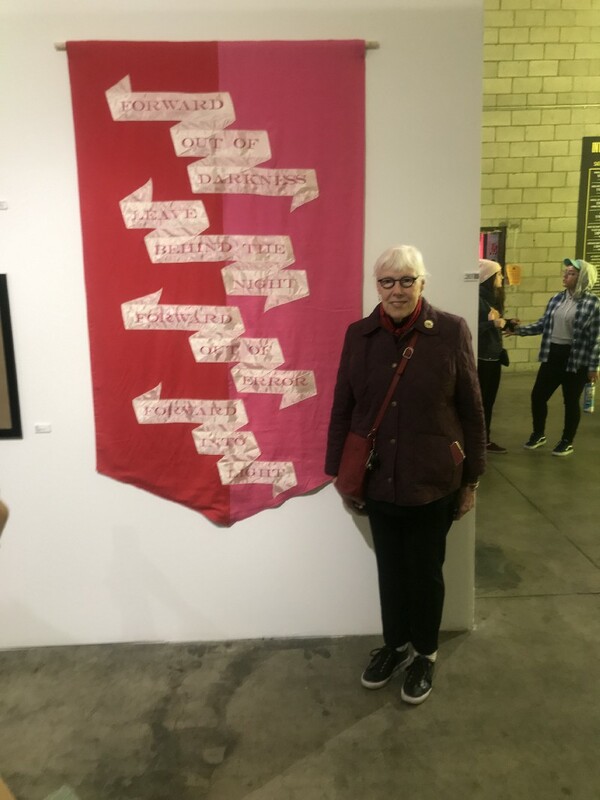 Zoe smiled and said, “I’m an Alice Paul scholar, and this is a representation of a banner with the words from a Quaker Hymn that was carried while Inez Milholland rode her horse Grey Dawn to the steps of the White House. 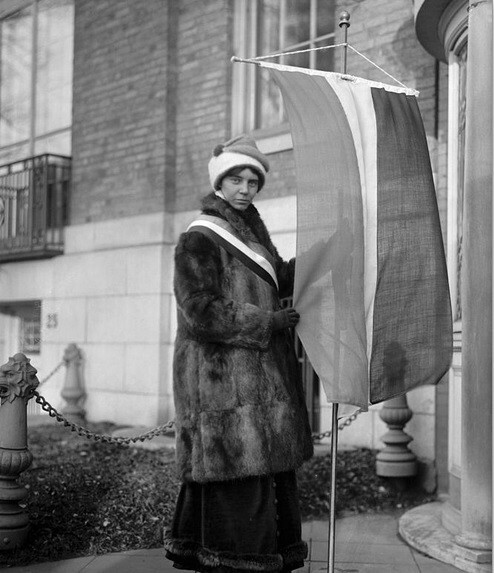 Over 105 years ago on March 3, 1913, the day before Woodrow Wilson’s inauguration, the National American Woman Suffrage Association organized a mass protest to advocate for the right to vote. Zoe ended up expanding on this to me, my friend Eleuthera and Gina Belafonte and others who were there. It was magical and inspiring. Zoe and I ended up talking for three hours after this chance meeting. Zoe Nicholson, herself is a name to note. Her activism for women and the human race is a beautiful, fierce, amazing read as she gave me her biographies and videos on marches, suffrage. We stand on the shoulders of giants and Zoe is one. She and I had a beach walk a couple of weeks ago, and I plan to have more with her. Zoe performs a one-woman show called Tea with Alice and Me. It will play in Long Beach on March 30 the at the Beverly O’Neill Theatre Center. I can’t wait to see it and bring a gaggle of folks with me. Written and presented by Zoe Nicholson, Alice Paul scholar, this full-length live performance brings Alice to life; from the 19th Amendment and the ERA to her work abroad and the militant tactics she created. Story-teller, Zoe talks about Alice’s life before and after August 26, 1920, as she lived another 57 years in militant insistence for gender equality around the world. This one-woman show is directed and produced by Wild West Women ED and filmmaker, Martha Wheelock. By chance…. I always feel thankful for the people that mysteriously become a presence in my life. There are many levels to creating change, and we need all of them to do so. There are people who are the fierce firsts, those that follow by that example and then the middle, then the masses, then the government. (a bit of what Zoe & I talked about). It’s wonderful to learn more about the history Women’s Rights and Civil Rights movements, I know a fair amount, but there is so much I don’t know. Thank you for tapping me on the shoulder, Zoe because we stand on yours, and Alice’s and so many others. She earned a bachelor’s degree in Roman Catholic Theology from Quincy University in 1969 and a master’s degree in ethics and religion from the University of Southern California in 1975. She taught high school for five years but left in 1976 to open a women’s bookstore in California called Magic Speller Bookstore. She has also worked as a systems analyst, production tester, and project leader on Wall Street, as well as co-founding a specialized recruiting firm offering expertise in client/server architecture and graphical design. She also has her own blog. She marched and lectured on gender equality for seven years, at the end of which in 1982 she embarked on a fast in Springfield, Illinois with six other women to convince Illinois to ratify the Equal Rights Amendment (it did not). For 37 days she lived on only water. In 2004 she published her memoir of this fast, titled The Hungry Heart: A Woman’s Fast for Justice. 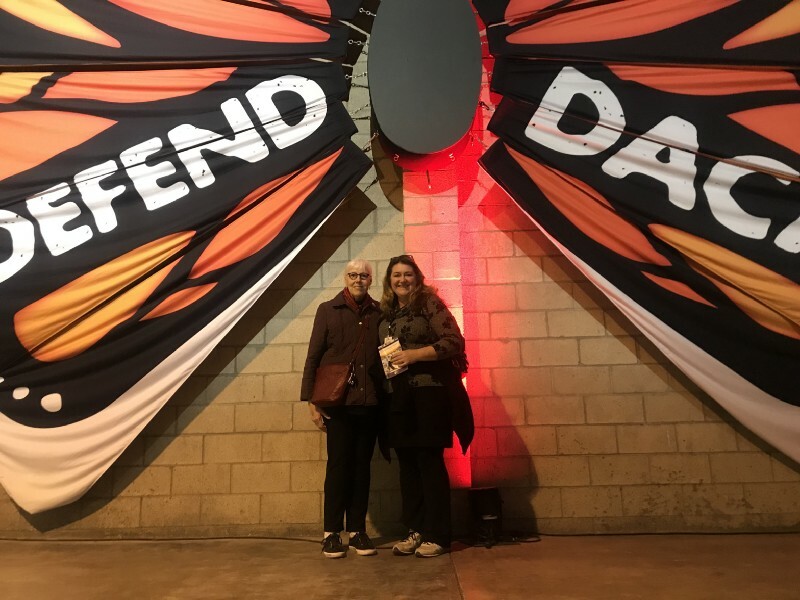 She is a member of the ERA Roundtable, a lifelong member of the National Organization for Women and a member of the Veteran Feminists of America. She was also featured in the gay rights film March On, about the National Equality March 2009, which she participated in; the film premiered September 12, 2010 at the Austin Gay and Lesbian International Film Festival. She is part of the Veteran Feminists of America, with a Special Portfolio for Facebook for them. From https://upclosed.com/people/zoe-nicholson/ The contents of this bio page were sourced from a Wikipedia article. The contents are available under the CC BY-SA 4.0 license. Newer PostGet LinkedIn Legit - Are You For Real?